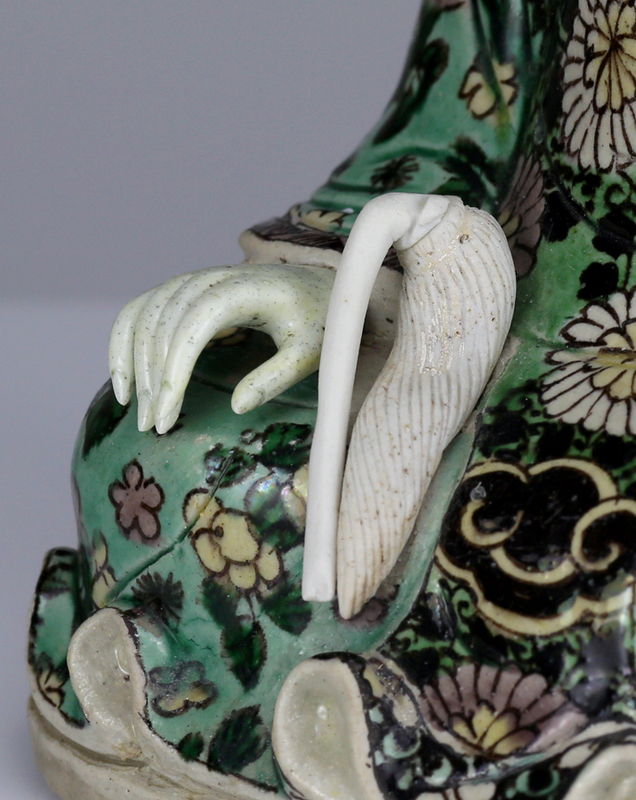 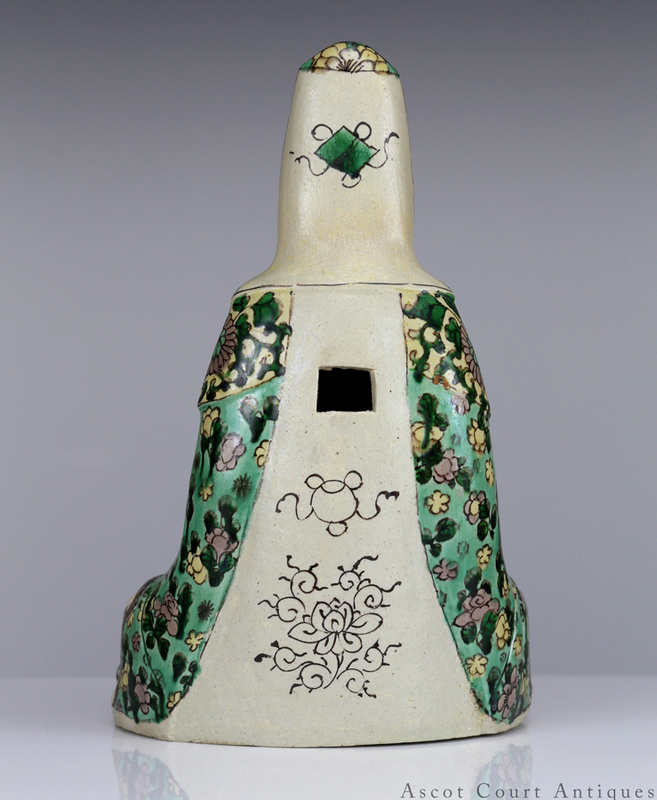 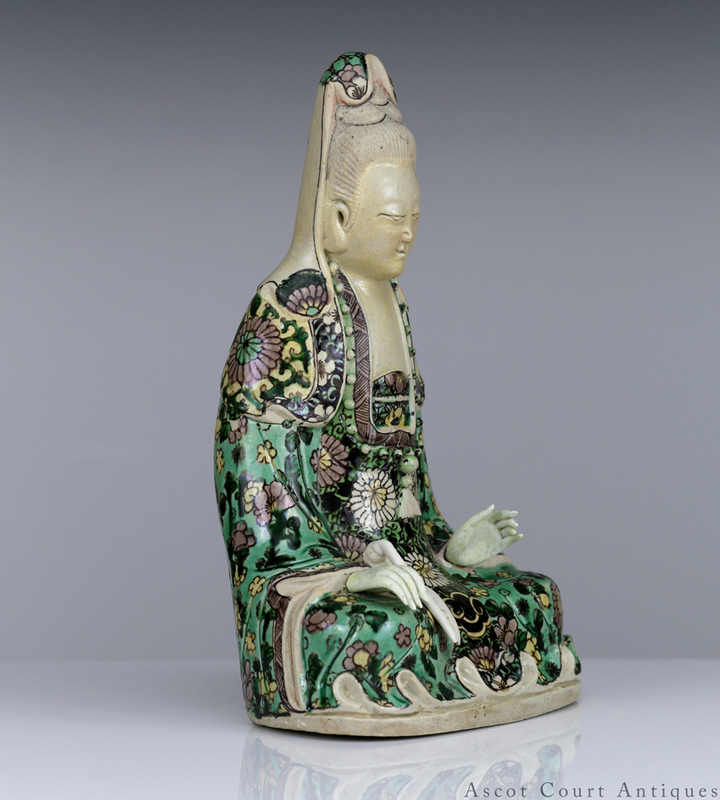 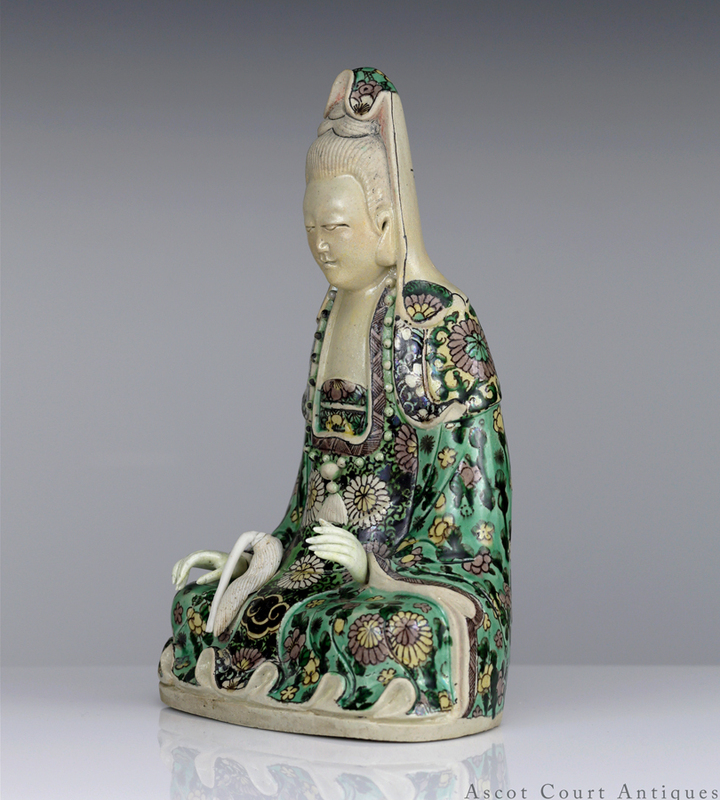 A rare Kangxi susancai guanyin, made from molded biscuit porcelain with applique details, enameled in the famille verte palette, and then fired at a lower temperature. 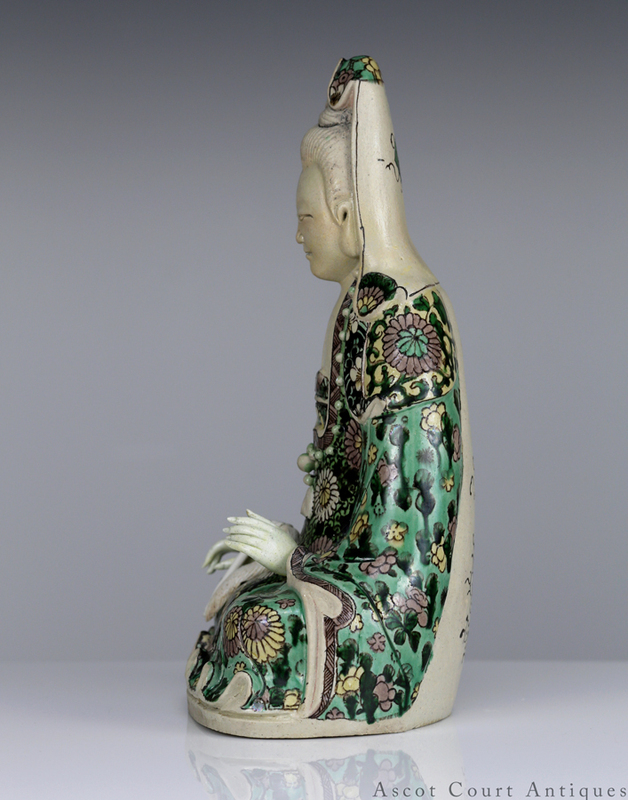 The figure of guanyin is rendered in a seated position, with her eyes meditative and downcast, and clothed in gorgeous draping robes decorated with chrysanthemum scrolls. 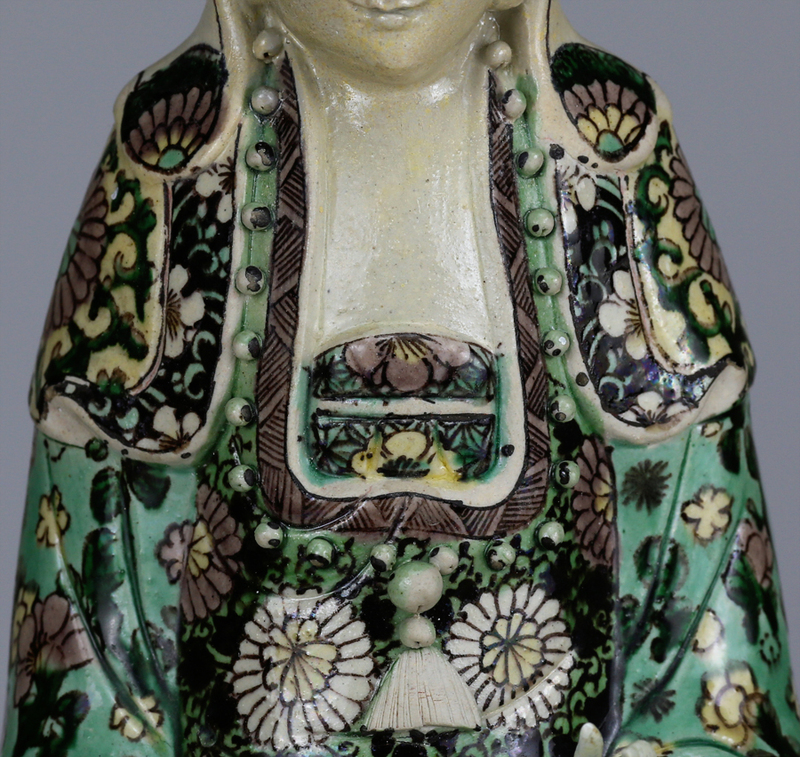 She wears a beaded prayer necklace and bears on her lap a fly whisk (chenwei), a symbol of the bodhisattva’s grace and mercy (for she would love all creatures such that rather than harm a fly, she would merely whisk it away). 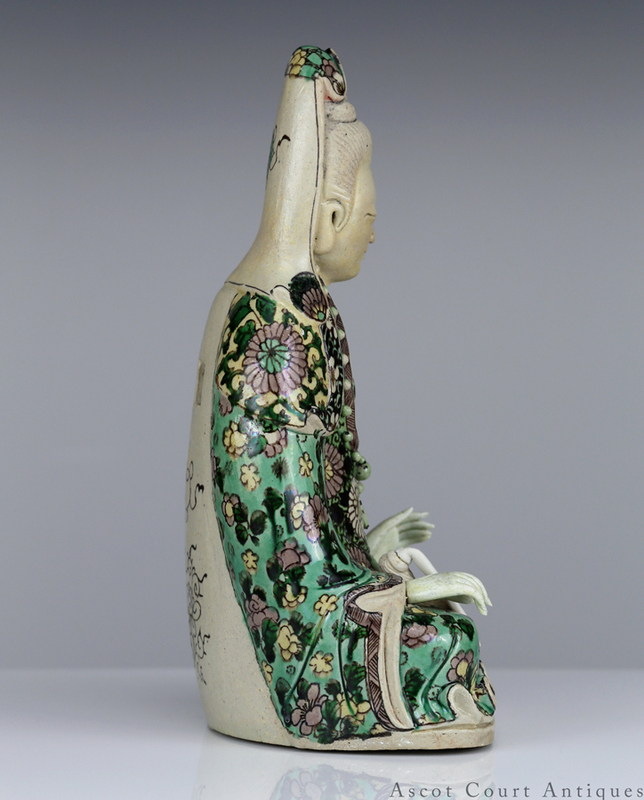 In the context of East Asian Buddhism, Guanyin is a Bodhisattva associated with compassion. 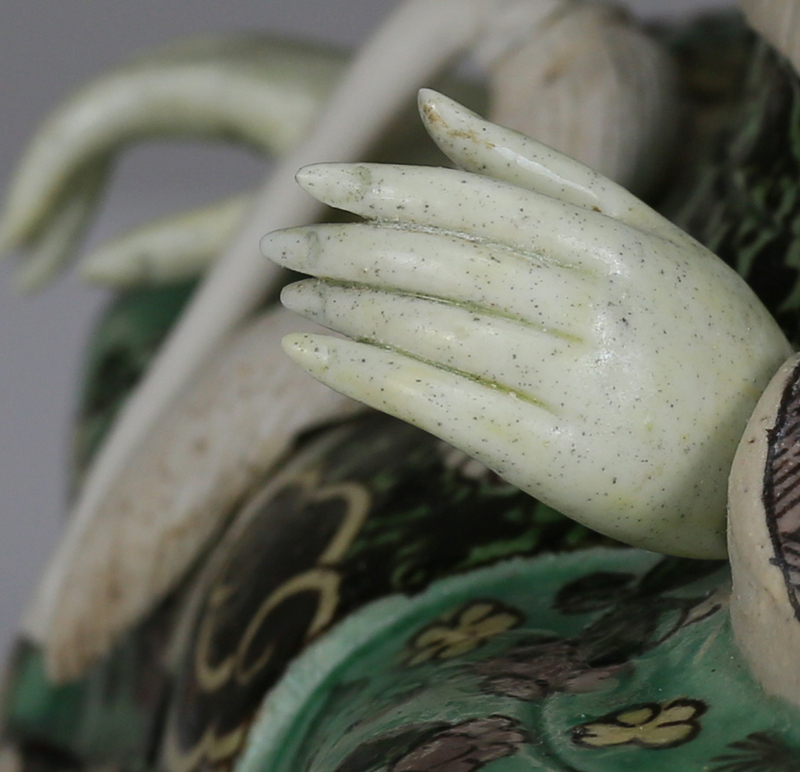 The Chinese characters that make up “Guanyin” specifically means “observer of sounds” (guan = observe; yin = sounds), conveying the belief that Guanyin is a listener of suffering sounds, and thus a tenderer of the world’s troubles. 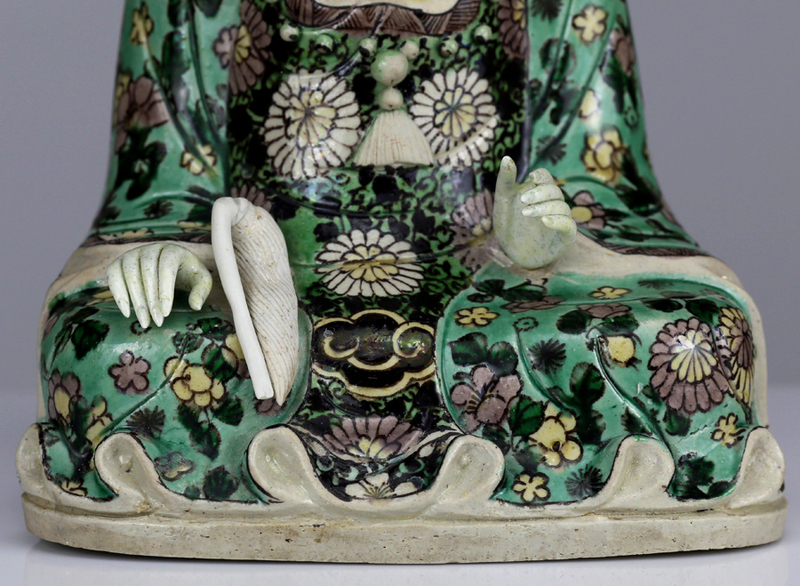 For this reason, most depictions of Guanyin in Chinese art feature the Bodhisattva looking downward, as if to watch over the mortal realms. 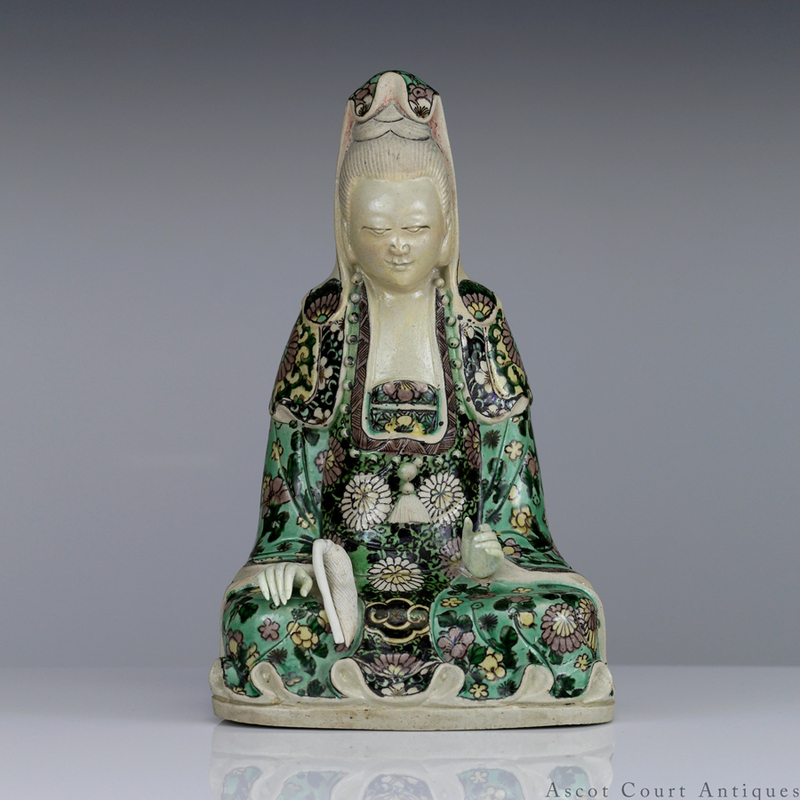 Similar susancai guanyin figures are in the British Museum (1947,0712.313) and the Victoria and Albert Museum (C.1275&A-1910). 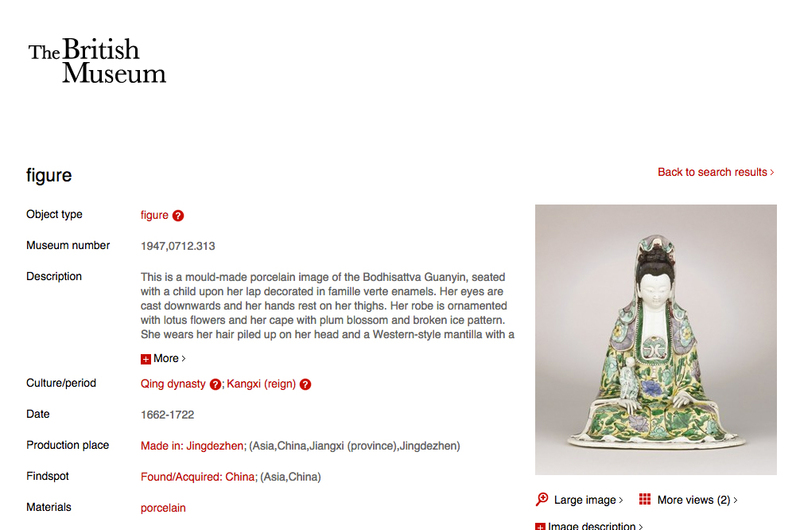 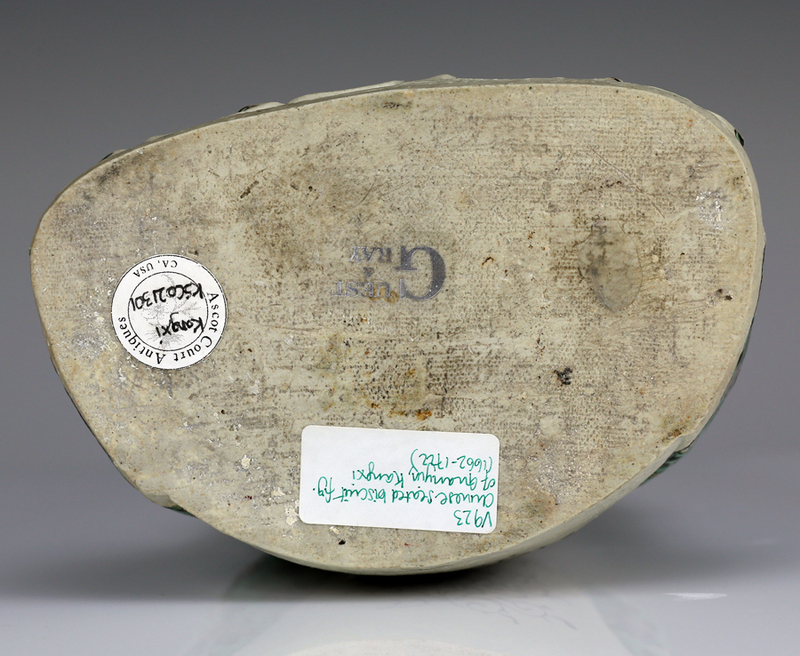 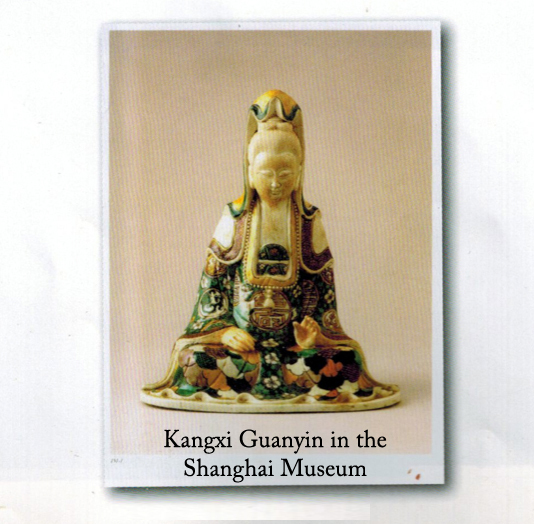 Another is in the Shanghai Museum (see pages 232-233 figure 151 of “Kangxi Porcelain in the Shanghai Museum”, 1998). 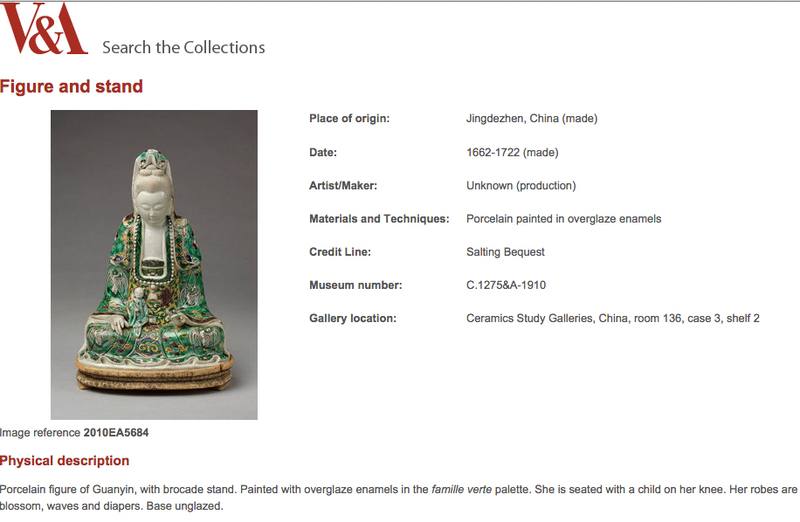 Another comparable figure sold at Sotheby’s (lot 331 sale n09006).